MOLLUSCA : NUDIBRANCHIA : Arminidae SNAILS, SLUGS, ETC. 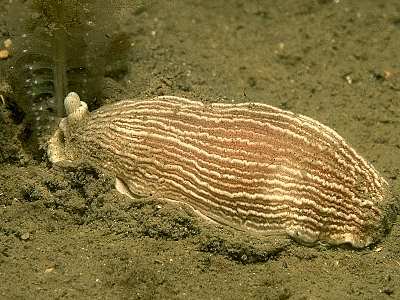 Description: Armina loveni is a flattened, leaf-like nudibranch growing to 40mm in length. The mantle bears a series of longitudinal folds or grooves, with the two short stubby rhinophores in an indentation at the front. There is a cephalic shield across the front of the head. At the junction of the foot and mantle a deep groove containing small gills runs along the sides of the body. The mantle is brick-red to dirty brown in colour, with pale lines along the tops of the longitudinal ridges. Habitat: This species is found crawling on the surface or burrowing in muddy sand, usually in company with sea-pens Virgularia mirabilis, on which it is presumed to feed. The spawn consists of a pale pink thread, tightly coiled in three dimensions. Distribution: Infrequently recorded, with recent records from the Kenmare River and Galway Bay, Strangford Lough and near Oban. Other records indicate a distribution from Norway to the Atlantic coast of France. Flattened leaf-like body with longitudinal ridges. Short stubby rhinophores at front of mantle. Picton, B.E. & Morrow, C.C. (2016). Armina loveni (Bergh, 1860). [In] Encyclopedia of Marine Life of Britain and Ireland.